Click here for audio of Episode 923. Today, a woman pioneers X-Rays in the early West. The University of Houston's College of Engineering presents this series about the machines that make our civilization run, and the people whose ingenuity created them. Elizabeth Fleischmann was born in the wild-west town of Placerville, California, just after the Civil War. Her parents were Austrian Jewish immigrants. Later, in San Francisco, the family fell on hard times. She had to drop out of high school and go to work as a bookkeeper. Then, when she was 28, Roentgen invented X rays on the other side of the world. Roentgen's invention riveted the public's imagination. 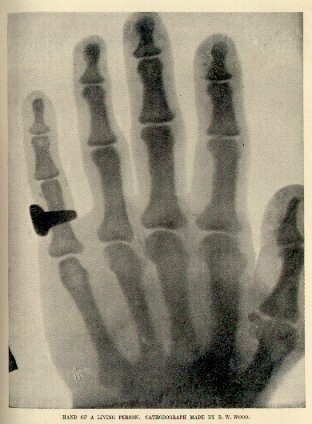 Do-it-yourself articles on X-ray devices reached San Francisco within a year. Elizabeth Fleischmann reacted with eerie vision. She somehow managed to set up a complete X-ray system in an office on Sutter Street the year after Roentgen's discovery. By 1900, Spanish-American War casualties were reaching San Francisco from the Philippines. They carried unremoved bullets and shrapnel in their bodies. Fleischmann was, by then, the best radiologist on the coast -- maybe best in the world, as well. She turned her Roentgen rays on the wounded with an uncanny spatial sense. She knew just how to triangulate on bullets lodged in the lungs or skull and steer surgeons straight to them. She knew just how to regulate exposures to match tissue densities. The chief of army medicine in San Francisco sent a set of her X-rays to the War Department. It was the best X-ray work the surgeon general had seen, so he went out to meet this E. Fleischmann who'd made them. He was astonished when he was presented with a shy young Jewish woman who violated every canon of 19th-century ethnic and gender prejudice. He caught his breath and went on to say she'd done the finest radiographic work he'd seen. Of course no one shielded themselves from X-rays. No one knew how vicious they were. Many early radiologists subjected patients to serious burns. Fleischmann was smart enough to avoid doing that, but no one yet knew about X-ray-induced cancer. It was normal practice for operators to hold their own hand in the rays to check exposures. And Fleischmann was now working long hours, year in and year out. By January, 1905, that terribly over-exposed arm had become cancerous and had to be amputated. She died seven months later. By then, ironically, she'd started the experimental treatment of certain cancers with X-rays. And, of course, such treatment goes on today. Much of what we know about Fleischmann comes from a single San Francisco Chronicle article about her work in 1900 and a 1905 obituary. After that the sands of history closed over her. She didn't fit the hero mythology of a century ago. Since we couldn't incorporate her into that mythology, we did the only other thing we knew how to do. We forgot her. Fleischmann married Israel Julius Aschheim, grand secretary of the District No. 4 B'nai B'rith, in 1900. At that time she did something quite unheard of in 1900. She adopted the hyphenated last name Fleischmann-Aschmann. I am greatful to Margaret Culbertson, UH Art and Architecture Librarian, for calling Fleischmann to my attention and providing the Palmquist source. For more on the new X-rays, see Episode 654. This X-ray photo appears in an article published in May of the year following Roentgen's discovery. The article consists of letters from distinquished scientists of the day, including one in which Edison analyses the construction of X-ray systems.